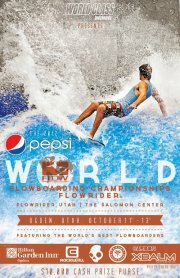 FlowRider Utah will host the prestigious fourth annual 2012 Pepsi World Flowboarding Championships – FlowRider® on October 12 and 13. The best flowboarders from around the world will convene at the Salomon Center for the largest FlowRider Championship event of the year. Competition festivities include concerts, free entertainment and a free meet and greet. The two-day community event is open to the public. Top international competitors and teams from Europe, Asia and U.S.A. will travel to Ogden, Utah to compete for the prestigious world championship title. It is the first time an event of this stature will be held on American soil. Top elite international flowboarders will battle for the World titles in Junior Flowboard and Bodyboard; Female Pro Flowboard and Bodyboard; and Men’s Pro Flowboard and Bodyboard divisions. Hundreds of athletes from around the world, and more than 6,000 spectators, are anticipated to attend the event. “During the past five years flowboarding has experienced phenomenal growth pushing the sport to new heights. We look forward to watching the exceptional international talent in Ogden this year,” said Shaun Hancock, manager of FlowRider Utah. Amateur locals and national competitors are invited to participate in the “Just Flow With It” pre-world amateur competition on Wednesday, October 10, 2012 from 6 to 10 p.m. It is $40 to participate in the first division and $15 for each additional division. The entry fee includes a practice session prior to the event from 4 to 6 p.m. In addition to the competition, a festival village, a high-flying acrobatics act, juggling/sword-swallowing/comedy performances and more will entertain spectators. Fans are invited to a free meet and greet with all competitors on Thursday, October 11 from 7 to 8 p.m. at the Salomon Center. Royal Bliss will take the stage with special guest the Codi Jordan Band on Saturday at 7 p.m. Tickets are $10 and may be purchased at flowriderconcert.regtix.com. “We encourage the community to mark their calendars and join the festivities at the Salomon Center,” said Hancock. For additional information visit www.flowriderutah.com, www.waveloch.com or call 801.528.5374 or 858.228.9319. About the sport of Flowriding Flowboarding continues to progress and attracts top athletes in skateboarding, snowboarding, wakeboarding and surfing. The sport was established more than 20 years ago. The FlowRider is a wave machine specifically designed by Wave Loch LLC, to simulate the perfect never-ending surfing wave. It offers the thrill of surfing, skateboarding and snowboarding in the size of a backyard pool. For more information visit http://www.waveloch.com/flow-competitions or http://www.facebook.com/FLOWtour. Wednesday, October 10, 2012 Just Flow With It, pre-world amateur competition Practice session 4 to 6 p.m. Competition 6 to 10 p.m.
Thursday, October 11, 2012 Professional practice session/media sneak peak 11 a.m. to 1 p.m. Practice sessions (advance sign up required) 1 to 6 p.m. VIP “Ride with the Pros” 6 to 7 p.m. Practice sessions 7 to 9 p.m. Athlete meet and greet 7 to 8 p.m. Welcome party (open to all competitors) 8 to 10 p.m.
Friday, October 12, 2012 Practice sessions · Session 1 8 to 8:40 a.m. · Session 2 8:40 to 9:20 a.m. · Session 3 9:20 to 10 a.m. Quarter finals 10 a.m. to 6 p.m. Best trick contest (rider’s judge) 6:30 to 7:30 p.m. · Bodyboard 6:30 to 7 p.m. · Flowboard 7 to 7:30 p.m.
Saturday, October 13, 2012 Festival village and community activities 11 a.m. to 10 p.m. Practice sessions · Session 1 8 to 9 a.m. · Session 2 9 to 10 a.m. Semi finals and finals 10 a.m. to 4 p.m. Royal Bliss and Codi Jordan Band Concert Awards ceremony and after party 7 to 10 p.m.